When Greenland was green in warmer times | Watts Up With That? In this one-minute video, University of Vemont scientists demonstrate how they discovered 3 million-year-old soil under the Greenland Ice Sheet. Glaciers are commonly thought to work like a belt sander. As they move over the land they scrape off everything—vegetation, soil, and even the top layer of bedrock. So scientists were greatly surprised to discover an ancient tundra landscape preserved under the Greenland Ice Sheet, below two miles of ice. He led an international team of scientists that reported their discovery on April 17 in the journal Science. Greenland is a place of great interest to scientists and policymakers since the future stability of its huge ice sheet—the size of Alaska, and second only to Antarctica—will have a fundamental influence on how fast and high global sea levels rise from human-caused climate change. The new discovery indicates that even during the warmest periods since the ice sheet formed, the center of Greenland remained stable; “it’s likely that it did not fully melt at any time,” Vermont’s Bierman said. This allowed a tundra landscape to be locked away, unmodified, under ice through millions of years of global warming and cooling. IMAGE: This is a piece of the GISP2 ice core showing silt and sand embedded in ice. Soon after this picture was taken, the ice was crushed in the University…Click here for more information. Rather than scraping and sculpting the landscape, the ice sheet has been frozen to the ground, “a refrigerator that’s preserved this antique landscape,” Bierman said. The scientists tested seventeen “dirty ice” samples from the bottommost forty feet of the 10,019-foot GISP2 ice core extracted from Summit, Greenland, in 1993. “Over twenty years, only a few people had looked hard at the sediments from the bottom of the core,” Bierman said. From this sediment, he and a team at the University of Vermont’s Cosmogenic Nuclide Laboratory extracted a rare form of the element beryllium, an isotope called beryllium-10. Formed by cosmic rays, it falls from the sky and sticks to rock and soil. The longer soil is exposed at Earth’s surface, the more beryllium-10 it accumulates. Measuring how much is in soil or a rock gives geologists a kind of exposure clock. The researchers expected to only find soil eroded from glacier-scoured bedrock in the sediment at the bottom of the ice core. “So we thought we were going looking for a needle in haystack,” Bierman said. They planned to work diligently to find vanishingly small amounts of the beryllium—since the landscape under the ice sheet would have not been exposed to the sky. “It turned out that we found an elephant in a haystack,” he said; the silt had very high concentrations of the isotope when the team measured it on a particle accelerator at Lawrence Livermore National Laboratory. The new research, supported by funding from the National Science Foundation, shows that “the soil had been stable and exposed at the surface for somewhere between 200,000 and one million years before being covered by ice,” notes Ben Crosby, a member of the research team from Idaho State University. To help interpret these unexpected findings, the team also measured nitrogen and carbon that could have been left by plant material in the core sample. “The fact that measurable amounts of organic material were found in the silty ice indicates that soil must have been present under the ice,” said co-author Andrea Lini at the University of Vermont—and its composition suggests that the pre-glacial landscape may have been a partially forested tundra. IMAGE: Scientists were greatly surprised to discover an ancient tundra landscape preserved under the center of the Greenland Ice Sheet, below two miles of ice. “We found organic soil that has…Click here for more information. Many geologists are seeking a long-term view of the history of the Greenland Ice Sheet, including how it moves and has shaped the landscape beneath it—with an eye toward better understanding its future behavior. It’s 656,000 square miles of ice, containing enough water, if fully melted, to raise global sea levels twenty-three feet—”yet we have very little information about what is happening at the bed with regards to erosion and landscape formation,” said Corbett. It’s amazing how they can always put a CAGW spin on any finding they make, no matter how counter-intuitive it is. Perhaps the same ‘hidden force’ that’s protecting the sub-acrtic moths has preserved the Greenland ice sheet. And just why would we want to recover Greenland with an ice sheet if its current one ever did melt off? Is ice better than green landscape? Now it’s covered with the 2nd largest ice sheet on the planet. But WE’RE ALL GONNA DIE!!!! This raises the interesting possibility of finding fairly fresh remains of long extinct species, either in Greenland or Antarctica. What they did and what they found is interesting but does not surprise – see closure history of the Panama Isthmus. And as far as this bit of climatism goes, if they are right, then if we keep on this trajectory maybe we won’t have another ice age. Or is that the climatists want one……..
“In hindsight, Callendar’s contribution was fundamental,” Dr Ed Hawkins, a climatologist at the University of Reading, said in a report published last year…. ***Nevertheless, the general public and many governments, while acknowledging the effect, are much less inclined to agree with scientists that man is to blame. And did Bierman study these “worldwide indicators” before making such a claim? Even if the Greenland ice sheet does disappear, it won’t go in a flash like some magic trick or a tsunami. It would take decades at the least. There’d be time to adapt, and for nations to claim and fight for new territory. And there’d be time for anyone affected by the gradual sea level rise to move and adapt. Had to get that last dig in. Actually what we NOW know is that we know even less than we thought. I used to date ice. Then I met a Dutch girl. It’s also hard to clear it off. I don’t see the article in Science. However, the following is interesting. They use the paired cosmogenic nucleotides 26Al and 10Be. Those are standards in geochemistry to measure erosion. The length of time a rock is buried after being exposed to cosmic rays on the surface can be determined by measuring the ratio of these cosmogenic isotopes in the sample. 26Al has a 0.7 myr half life, and 10Be 1.3 to 1.5 myr. See the second ref below for a discussion of dating methodology. 21Ne is also useful. See http://noblegas.berkeley.edu/~noblegas/files/BalcoShuster(2009b)_Al_Be_Ne_burial_dating.pdf. You can read the entire article. “The ice sheet will not survive.” I’m very sorry to hear such unscientific garbage from people who just did such a good research project. Why garbage? About a year ago, Dahl-Jensen of the Niels Bohr Institute did a similar ice core study of Greenland. They found that during the Eemian, the warmer interglacial that preceded our own interglacial period (the Holocene), Greenland was about 8 degrees warmer than today for at least 6,000 years. During that time period, it lost 1/4 of its ice, or about 6 feet (note the U Vermont researchers say that if all of Greenland’s ice melted, it would be 23 feet, so 1/4 of that is almost 6 feet). That translates to a little over an inch per century over 60 centuries. There isn’t any way we are going to keep putting CO2 up, century after century, once solar cells become cost effective, and can be put on rooftops and sides of buildings, and in pretty much any desert. So these scientists should know better than to say Greenland’s ice won’t survive. Sounds like someone has been looking in my refrigerator. Yes, the Greenland ice sheet formed 2.7 to 3 millions years ago. The earth has endured this present ice age for almost exactly the same length of time. The Greenland ice sheet’s existence is the symbol of this present ice age. Once it melts, this ice age will be officially over. That is not hard to take. Why do the warmist alarmists want the earth to remain in this ice age is beyond me. Why do the warmist alarmists want the earth to remain in this ice age is beyond me. Like Algore, they own beach front property. So studying grant land.. er Greenland is fundamental to understanding how fast and how high sea levels will change due to human caused climate change. And how would that differ from Gia climate change? Are there any earth scientists anywhere that are not morons, or is it just the ones getting government grants for research that tries to convince us observed climate data are wrong that come off so ignorant? Once again skeptics are right: Greenland’s ice is dynamic, and has grown and shrunk tremendously over time without destroying the planet. I have a solution to the problem. Anyone who is displaced by rising sea levels from the melting Greenland Ice Sheet, shall be granted a parcel of land in….Greenland…where the land will be green and pure. I can’t seem to find a WUWT article anymore. It showed a calculation saying that if melting of Greenland continued at the present rate, the volume of ice wouldn’t change by the end the century – rounded to two significant digits. Anyone got the link? If all the ice was gone, then the flooded land from sea level rise would not be occupied, the people would have moved on long ago, perhaps to Greenland, and you wouldn’t have a reason to put the ice back on Greenland. However, the timelines are so long that surely by then man would have moved on to other energy sources long before then. However, again, the true believers also seem to believe that CO2, once emitted or released from a fossil fuel, stays in the atmosphere for thousands of years when its closer to 5 to 7 years. Also, the sea levels would drop in areas around the missing mass of ice of Greenland. “But if we keep on our current trajectory, the ice sheet will not survive. ” said Bierman. BS . Drawing a straight line through 1975-1995 may delude you to think so, but sorry doc, climate is not that simple.Projecting out the several thousand years it would take to melt GIS from a 20 year data sample is stupid. Best to stay in your own area of specialised research when making public statements. Gee they never quit do they. It has been known for eons, that Greenland is a large bowl full of ice, which would have to climb mountains to slip off into the ocean. And that lost squadron in 1942 or thereabouts was found buried under some 260 feet of solid ice. That’s more than three feet of ice deposition each year (on average). Glacial erosion depends on gravity. The flow is plastic and requires some distance to build momentum. I would wager the center of Antarctica is not scoured either. We show that high-altitude southern Greenland, currently lying below more than 2 kilometers of ice, was inhabited by a diverse array of conifer trees and insects within the past million years. The results provide direct evidence in support of a forested southern Greenland. Glaciers are commonly thought to work like a belt sander. As they move over the land they scrape off everything—vegetation, soil, and even the top layer of bedrock. So. Soil exposed to the atmosphere is not depleted in 10Be, as we can see it in present day Alaska. After that I wonder what makes them think ice has never melted during the last 2.7 million years at the GISP2 site. If it did, meltwater would have brought down all the 10Be previously accumulated in the ice sheet, just to cover it with ice again as soon as cold conditions returned. That is, we could see the same 10Be enrichment at the bottom layer, so its presence tells us nothing about ice sheet history. “So we thought we were going looking for a needle in haystack,” Bierman said. They planned to work diligently to find vanishingly small amounts of the beryllium—since the landscape under the ice sheet would have not been exposed to the sky. “It turned out that we found an elephant in a haystack,” he said; the silt had very high concentrations of the isotope when the team measured it on a particle accelerator at Lawrence Livermore National Laboratory. 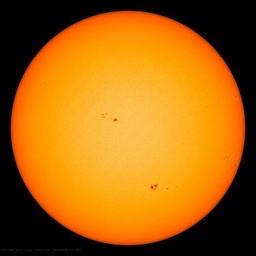 What must be the intensity of cosmic rays and solar activity? It is hardly surprising that there has been glaciation. In a 32-page report, the DOE’s Inspector General reviewed the case of Colorado-based Abound, which filed for bankruptcy protection in June 2012 and laid off more than 100 employees, after receiving about $70 million of a $400 million loan guaranteed by the government. Since the Abound situation, the DOE also set up a risk committee. Undeterred by problems with its loan guarantees, the Obama administration on Thursday convened a “Solar Summit” to promote the use of the technology by private companies. Some $15 million will be set aside for state, local and tribal governments to build their solar portfolios. Renewable energy now accounts for around 5 percent of electric generation in the United States. Solar comprises less than 1 percent, although its use is on the rise. I just about choked when I saw that LOUTL , thanks LOL I am Dutch, but then I met a young lady from Wales, Talk about breakink Ice. (40 years ago) thanks. I am Dutch, but then I met a young lady from Wales, Talk about breakink Ice. (40 years ago) thanks. Was she from Snowdon ??? I am getting tired of the time frames used in some of these models papers and reports, 2 million years here, 4 million years there. I have lived and farmed on my property for a little over 25 years in some places the land has “settled” 6 to 10 feet (ok, 2-3 mtrs) without a 2 mile icecap. Add to that that in a news item today the “Keppler” scientists have found an earth like “Rockey” planet 500 light years away in a solar system where it is called “Kepler186-F” . Sorry but can some one help me here ? How can we see a “rockey” planet the size of earth 500 light years away? (We can barely see ice movements in the arctic from a 100 miles up!) In a solar system that has a red dwarf star (less bright than our sun). Can some one put that in physical perspective . LOL, The snow melted thanks, but no I hope I spell it right : Glynngorrick? I was hoping, from the headline, that that these fellows might be interested in more recent warming in Greenland. A fringe of scrub apparently comes and goes on the very coast, and when viewed from the sea Greenland actually is green during warm periods, even on the east coast. The Vikings could utilize easterly winds travel a northern route from Norway to Iceland and across the Denmark Strait to Greenland without ever seeing sea-ice, during the Medieval Warm Period. Sadly, showing how much warmer it was in Greenland during the Medieval Warm Period is frowned upon. Therefore, (rather than seeking to understand the twists and turns of our current climate, and perhaps discovering information that could be useful to the farmers and fishermen of our current age,) our young scientists are redirected to the study of murky, folded ice that is of little value at all to anyone. It is just one more way to waste time and money. This is not so. Important is honesty. Long cycles of the sun is 88 and 208 years. Whether one man is able to memorize the weather before the 88 years? Cosmogenic 10Be in polar ice cores is a primary proxy for past solar activity. However, interpretation of the 10Be record is hindered by limited understanding of the physical processes governing its atmospheric transport and deposition to the ice sheets. This issue is addressed by evaluating two accurately dated, annually resolved ice core 10Be records against modern solar activity observations and instrumental and reanalysis climate data. The cores are sampled from the DSS site on Law Dome, East Antarctica (spanning 1936–2009) and the Das2 site, southeast Greenland (1936–2002), permitting inter-hemispheric comparisons. Concentrations at both DSS and Das2 are significantly correlated to the 11-yr solar cycle modulation of cosmic ray intensity, rxy=0.54 with 95% CI [0.31; 0.70], and rxy=0.45 with 95% CI [0.22; 0.62], respectively. For both sites, if fluxes are used instead of concentrations then correlations with solar activity decrease. The strength and spectral coherence of the solar activity signal in 10Be is enhanced when ice core records are combined from both Antarctica and Greenland. The amplitudes of the 11-yr solar cycles in the 10Be data appear inconsistent with the view that the ice sheets receive only 10Be produced at polar latitudes. Significant climate signals detected in the 10Be series include the zonal wave three pattern of atmospheric circulation at DSS, rxy=−0.36 with 95% CI [−0.57; −0.10], and the North Atlantic Oscillation at Das2, rxy=−0.42 with 95% CI [−0.64; −0.15]. The sensitivity of 10Be concentrations to modes of atmospheric circulation advises caution in the use of 10Be records from single sites in solar forcing reconstructions. The ice at the bottom is only 105,000 years old at GISP site (although some of the folds may have been 240,000 years old). At the NEEM site in the north, they recovered 128,000 year old ice. It melts at the bottom due to heating from the bedrock. The ice at the bottom has a temperature of -2.7C to -3.0C which is enough to slowly melt it given the pressure. And the soil underneath is 2.7 million years old. In the southern part of Greenland, at the bottom of the core, they recovered vegetation remnants including wood from Conifers which is thought to be from the interglacial of 400,000 and 800,000 years ago. These interglacials were longer than normal at 25,000 years which was enough to melt out the ice and have trees grow there even though these were not warm interglacials, just long ones. So the ice in southern Greenland continues melting in an interglacial, it just takes a long time for all that ice to melt. It is too far south to have glaciers in interglacial conditions. So, 2.7 million years ago, continental drift took northern Greenland and central Greenland, just that far enough North, so that glaciers could build up. It has been moving north-west for 55 million years. Glaciers start up, the planet’s Albedo increases to 29.5%, from 28.5%, and now the northern hemisphere becomes succeptible to the downturns of the Milankovitch Cycles and the ice ages begin. Please see the new test method beryllium. When the Isthmus of Panama formed, cutting off the Atlantic and Pacific oceans in the tropical zone, that seemed to have been the start of the Greenland ice sheet’s growth. The isthmus formed about 3 million years ago. I don’t understand how they get away with it. When I was doing an M.S. in Earth science my professor explained in one of his lectures that Greenland is concave because of the weight of the glaciers and therefore the glaciers do not move in the same way as other glaciers, scraping off the rocks and ancient soil. As I remember the lectures, the Greenland ice sheet was formed in the Pliocene some time between 5 million years and 1.6 million years ago. As for the suggestion that plate movement was significant over 2.7 myr, say northerly plate movement was 30 mm per year, fairly fast, that’s 81 million mm. or 81 kilometers, about 50 miles. No big deal. When did “we”, meaning us homo sapiens or even hominids, EVER have stable coastlines everywhere? Never, as far as I can see. And did Bierman study these “worldwide indicators” before making such a claim? Even if the Greenland ice sheet does disappear, it won’t go in a flash like some magic trick or a tsunami. It would take decades at the least. Many thousands of yrs under the worst IPCC scenarios, hundreds of thousands realistically. Prb’ly enough time to step back from the beach alittle. So we need to prevent the ice from melting on Greenland to prevent us from being over run by Vikings. Capitol One would hate us for that. They worked diligently to PROVE vanishing ice sheets…but didn’t find them so we make stuff up to keep the hysteria going….sounds a bit like Mothra, doesn’t it? If I had written this, I would be deeply embarrassed, not worried. And in Nepal, the vanishing glaciers there had a huge avalanche which killed the Sherpas there. So what is new here? We already know that it is about 2.5 million years since most of Greenland was ice-free from studies of the Kap Köbenhavn formation on northern Greenland (Note: all of Greenland has probably not been ice-free for tens of million years, there is a major mountain chain under the ice in Eastern Greenland which was ice-covered even when there were palms and parrots in central Europe). There is some evidence that southern Greenland may have been largely ice-free at some point in the Early Pleistocene 0,5 – 1 million years ago, but most of the Greenland icecap has stayed intact through Interglacials that lasted more than twice as long as the present one (MIS 11) and when local temperatures were 5-10 degrees warmer than now (MIS 5e). That there was conifers (spruce) in Greenland in earlier interglacials but not this one is no big deal. All plant-life in Greenland (except possibly in the far north) is wiped out during each ice-age and has to recolonize during each interglacial. Spruce has not managed to reach Greenland this time (possibly because it has for some reason not reached the westernmost parts of Europe), but it has now been introduced and grows pretty well in southern Greenland. But barley still won’t grow there like it did in the MWP. Are you in fact talking about sea level change? There’s a great deal more than 23 vertical feet of ice on Greenland. The maximum thickness is about 4,000 meters IIRC. Darn it. Did it again. Digging up a quote from Mrs Thatcher is cherry picking for she, with help from Lord Monkton, saw through the scam because she was a scientist! “But if we keep on our current trajectory, the ice sheet will not survive. And once you clear it off, it’s really hard to put it back on.” They always have to make a comment like that. And they wonder why skeptics are so skeptical….. If Eric The Red were alive today he would recommend against trying to settle in Greenland. Greenland is not going into thermageddon meltdown like in the 1930s and 1940s. People panicked then just as now. …….Here we present the new North Greenland Eemian Ice Drilling (‘NEEM’) ice core and show only a modest ice-sheet response to the strong warming in the early Eemian. We reconstructed the Eemian record from folded ice using globally homogeneous parameters known from dated Greenland and Antarctic ice-core records. On the basis of water stable isotopes, NEEM surface temperatures after the onset of the Eemian (126,000 years ago) peaked at 8 ± 4 degrees Celsius above the mean of the past millennium, followed by a gradual cooling that was probably driven by the decreasing summer insolation. Between 128,000 and 122,000 years ago, the thickness of the northwest Greenland ice sheet decreased by 400 ± 250 metres, reaching surface elevations 122,000 years ago of 130 ± 300 metres lower than the present……..
Now why do they ignore the other pole I wonder? Enhanced snowfall on the East Antarctic ice sheet is projected to significantly mitigate 21st century global sea level rise. In recent years (2009 and 2011), regionally extreme snowfall anomalies in Dronning Maud Land, in the Atlantic sector of East Antarctica, have been observed. It has been unclear, however, whether these anomalies can be ascribed to natural decadal variability, or whether they could signal the beginning of a long-term increase of snowfall……. About a decade ago we saw a number of papers and letters pointing to a decline in Antarctic sea ice extent. It shows you what you can find if you look really hard. …..there has been a 20% decline in SIE since about 1950. …..
….. This comparison shows that only regional perturbations took place earlier, without significant deviations in the mean ice extents, from the pre-1950s to the post-1970s. This conclusion contradicts that previously stated from the analysis of whale catch data that indicated Antarctic sea ice extent changes were circumpolar rather than regional in nature between the two periods. The authors were “greatly surprised” with the result. What kind of glacial movement and alternate results were they expecting in the case of a continent-sized bathtub morphology? If the Greenland ice sheet were to melt, I wonder how much of Greenland would remain above sea level. It would depend upon whether the ice melted faster than the isostatic rebound. The findings of this study would seem to indicate that it takes a very long time for the ice to melt, much longer than any interglacial during the current ice age. You know, it’s not nice to slam the global warming ad at the end of every study. That’s the requirement for getting the grant these days, and a few words of transparent bullstucco is the price researchers must pay for the basic science “above the fold”. It’s unfortunate, but research doesn’t pay for itself and will always be at the mercy of whoever has the gold making the rules. The last paragraph of the quoted article is such retarded gibberish that its an embarrassment to the human race. “There is an interesting point to mention in passing. Though the ground is frozen 1,900 feet down from the surface at Prudhoe Bay, everywhere the oil companies drilled around this area they discovered an ancient tropical forest It was in a frozen state, not in petrified state. It is between 1,100 and 1,700 feet down. There are palm trees, pine trees, and tropical foliage in great profusion. In fact, they found them lapped all over each other, just as though they had fallen in that position. What he then goes on to reveal in the particular chapter is truly mind blowing. The point I make is that evidence is readily available to scientists, should they bother to seek it, that the Arctic region was once tropical until a major climatic event occurred to change that. While I applaud this kind of “Let’s actually see if our surmises are correct” science, in this case I submit that the interpretation of this evidence may not be warranted. I argue that it is NOT clear from what is known if the ice over GISP2’s location moved or not. According to The Summit core was taken at 72° 36′ N, 38° 30′ W. Its name is quite descriptive. This is the top of the ice sheet in Greenland. That means that the amount of ice movement there is minimal or even possibly non-existent. A few mouse movements on Google Earth at that are will reveal a generally flat summit area for quite a distance around the core location. What does that mean? Ice does not flow over flat ground; people tend to think that all ice of any great thickness flows downhill. Yes, that is true – IF the underlying ground allows it – if there IS a downhill. We are all familiar with the fact that water flows downhill – unless what? If there is a berm to contain it (forming a basin), water does what instead? It forms a pond or a lake. Or in really small cases, water forms puddles or bogs. As is common in tundras. So, if the land is flat or has a basin, then the ice will stay put and not move. Glaciers flow for one of two reasons: The ground has a slope to it, and/or the ice above it pushes it – both are due to gravity. So GLACIERS scour nthe ground inderneath. It is altogether unproven that ice at the top of Greenland or Antarctica itself moves. That ia an assumption, but should not be accepted as rtue in all cases. Sometimes yes. Sometimes no. Which is the GISP2 location? Do we know? From the description they have found tundra-like soil at that location. I submit this photo as an example of tundra land: http://en.wikipedia.org/wiki/File:Tundra_in_Siberia.jpg Other tundra photos are available. Go look at them. Some are on land which is flat, some are not so flat. So ice over tundras may flow downhill or they may not – depending if a “downhill” exists or not. With only one geographic data point in the GISP2 core, it is likely that it cannot be established whether the tundra below is flat or had some downhill to it – unless precise local maps exist of the terrain underneath. If no downhill exists, then there is little to no reason for the ice above it to have ever moved. Thus the conclusion about ice scouring is premature. IMHO. If we keep it up, the ice sheet won’t survive, despite dating back 3 million years? They’re really getting desperate for cata-scenarios, now. What horse pucky. @pat April 17, 2014 at 6:28 pm – If you are still around, you might be interested in the 1955 paper “HAS THE AMOUNT OF CARBON DIOXIDE IN THE ATMOSPHERE CHANGED SIGNIFICANTLY SINCE THE BEGINNING OF THE TWENTIETH CENTURY?” by Giles Slocum (U. S. Weather Bureau, Washington, D. C.) questioning Callendar’s selection of data and Callendar’s conclusions. “Callendar’s and Buch’s averages appear, as presented in figure 1, to show an increase in COz from the late nineteenth century to the beginning of the middle third of the twentieth. Their comparisons are, however, based on a narrow selection of values from a much larger body of data, scattered through the scientific literature of the past century. It may be granted that the data they used are probably quite accurate averages for the time, place, meteorological conditions, etc., of observation. The question remains, however, are all the measurements which they did not use, inaccurate? Buch who followed Callendar, accepts without challenge Callendar’s selection of data, and merely adds his own observational material. Hutchinson  bases his statement that CO, has increased on Callendar’s results, although he limits his corroboration to the case of the air in the North Temperate zone. Brown and Dingle alone offer any new evidence on the amount of C02 in the atmosphere, and their evidence, if it be not negative, is not necessarily confirmatory. Callendar making older data values lower and recent data values higher – by the way he rejected data – is similar to the climate scientists who keep adjusting older values down, and by doing so appearing to give a steeper and more sinister slope to the increases in global temps. Rejecting inconvenient data we now call cherry picking. I would also point out that in Slocum’s presentation of Callendar’s data, neither of them happened to note that Callendar’s data was NOT for the entire 19th century (the great majority was after 1866). In fact, Callendar listed two collections of data from the first half of the 19th century (probably the first ever data studies on CO2) – and BOTH of those had values over 400! These were higher than even NOW. You can google if you wish, but you will get the same answer. Certainly, the ice goes far higher vertically, as ice on Greenland, but it isn’t spread out over all the oceans, as it would be if it melted. That is why ice that goes to 10,000 feet, if melted, would only add the 23 feet to sea level rise. Interesting time stamp versus the closure of the Isthmus of Panama and onset of the Pleistocene. If none of the interglacials re-exposed those strata, then we can safely say we really are still, technically speaking, still in a Pleistocene regime, and our notion of The Holocene is sort of bogus.